In celebration of Women’s History Month, the Northern Manhattan Arts Alliance (NoMAA) presents Women in the Heights – Celebrations, an exhibition displaying works by 26 women artists residing in Washington Heights and Inwood, curated by Andrea Arroyo. Special Weekend Hours: Sunday 17 March, 11 a.m. – 2 p.m.; Saturday 13 April 1–4 p.m. 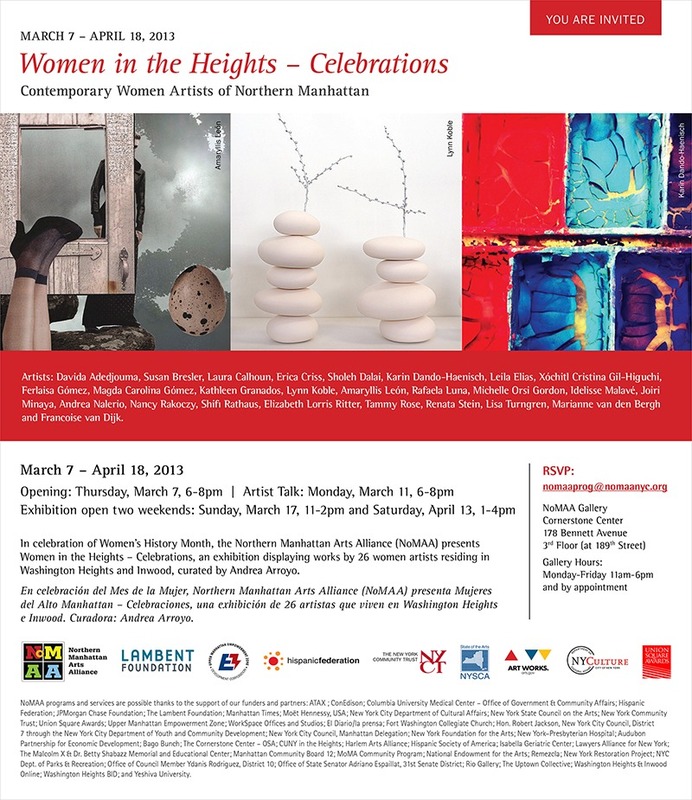 Opening Reception: Thursday 7 March, 6–8 p.m.
Artists Talk: Monday 11 March, 6–8 p.m.
Artists: Davida Adedjouma, Susan Bresler, Laura Calhoun, Erica Criss, Sholeh Dalai, Karin Dando-Haenisch, Leila Elias, Xóchitl Cristina Gil-Higuchi, Ferlaisa Gómez, Magda Carolina Gómez, Kathleen Granados, Lynn Koble, Amaryllis León, Rafaela Luna, Michelle Orsi Gordon, Idelisse Malavé, Joiri Minaya, Andrea Nalerio, Nancy Rakoczy, Shifi Rathaus, Elizabeth Lorris Ritter, Tammy Rose, Renata Stein, Lisa Turngren, Marianne van den Bergh, and Francoise van Dijk.